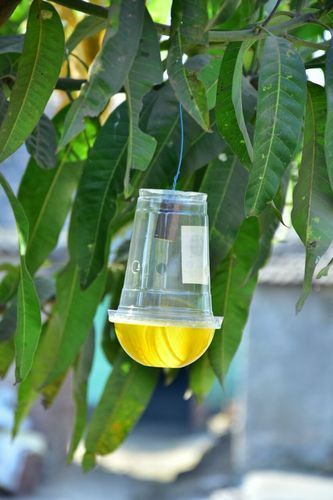 Designed to trap different fruit fly species in vegetable and fruit crops. Host Crops: Gherkins, Cucumber, Mango, Pumpkins, Mask melon, Watermelon, Guava, Sapota, Citrus, Banana, Papaya, Bottle gourd, Bitter gourd, Sweet gourd, Snake gourd, Ridge gourd, Pointed gourd , Sponge gourd. Target Pests: Bactrocera cucurbitae (Melon fruit fly), Bactrocera dorsalis (Oriental fruit fly), Bactrocera Zonata(Peach fruit fly), Bactrocera correcta (Guava fruit fly).